The heritage values of Queensland’s Cultural Centre (QCC) will be protected under a new Conservation Management Plan (CMP). Arts Queensland commissioned the CMP to provide a framework to understand and manage the Cultural Centre’s heritage values, guide future planning, and ensure it thrives and adapts into the future. 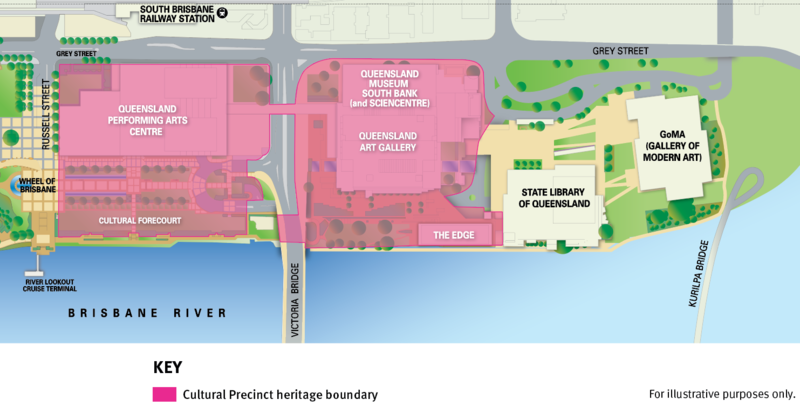 The plan identifies the significant heritage and architectural elements of the Cultural Centre, at South Brisbane, and sets out policies and guidelines on how any maintenance, alterations or additions should be managed. Under the CMP, specialist advice will be sought to review any work planned for the site relating to its architecture or landscape, including maintenance or alterations that may impact on its heritage significance, in line with CMP guidelines. The original buildings of the Cultural Centre were heritage listed in 2015. This includes the buildings and integrated landscape, designed by the late Robin Gibson AO, for the Queensland Art Gallery, Queensland Museum, Queensland Performing Arts Centre and The Edge managed by the State Library of Queensland. The Cultural Centre was initially developed in stages between 1976 and 1988, it cost more than $200 million at the time. A fifth stage, The Playhouse Theatre, was completed in 1998. This was followed by the redevelopment of the State Library and the opening of the Gallery of Modern Art in 2006. Since the Queensland Art Gallery opened in 1982, the Cultural Centre has evolved into the arts and culture centrepiece of the state – a place to discover, preserve and share Queensland’s natural and cultural heritage. In 2017–18, more than 7 million visits were recorded across the four cultural institutions with a significant number being interstate and international visitors. The buildings and landscaping within the Cultural Centre are considered an exceptional example of late 20th century International Style architecture. The CMP was developed by a team of specialist heritage consultants led by Brisbane-based architectural practice Conrad Gargett, in consultation with the Queensland Premier’s Cultural Centre Design and Heritage Roundtable. Barrister and former Queensland Arts Minister, the Honourable Matt Foley. Input was also received from the cultural institutions within the Centre, key industry body Australian Institute of Architects, professional organisations, other key stakeholders and from the broader community, as part of an extensive consultation process.